Cyclists on Arlington Blvd (not Route 50, the parallel street) in Rosslyn, just past the N. Rhodes St. bridge over Route 50, should beware of the above pothole. I've reported it on Arlington County's handy online Residential Maintenance Report Form. 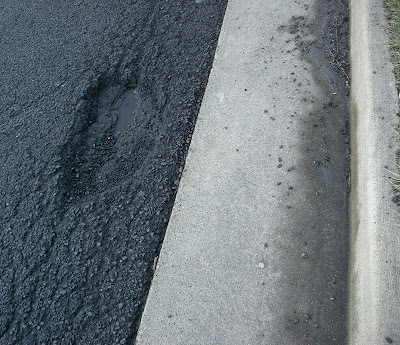 Report potholes and support your environment-helping, traffic-reducing, heroic neighbors who Bike to Work.